Sponge Bob is known in France too. Here he is, Bob l'éponge, in an outsider environment in the Toulouse area in the south of France. Joseph Donadello was born in 1927. He is of Italian descent, so quite probably, like other Italians, he migrated to France to work there as a mason. Donadello had that job for many years, but due to an accident, he had to find other work. And then he had all kinds of professions, like postman. shoemaker and truck driver. 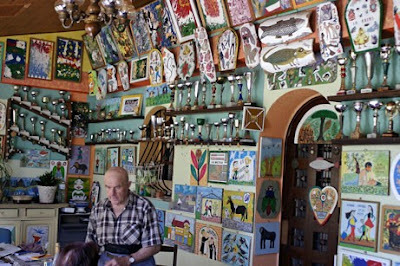 Being retired in 1981, around 1985 he began decorating his garden with a variety of creations. The garden has a lot of sculptures of persons and animals made from concrete and painted in bright colors. You will find Adam and Eve, Mickey Mouse, Romy Schneider. Laurel and Hardy, and so on, all together over 200 representations. 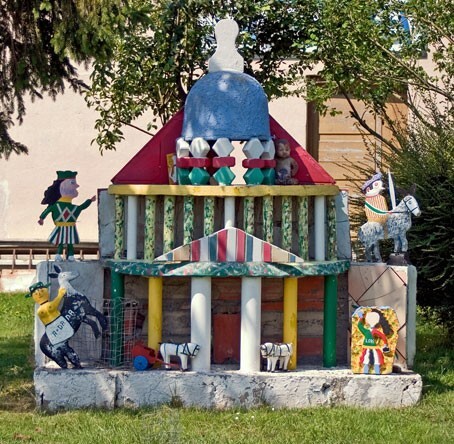 The sculptures have a somewhat two-dimensional character. But Donadello also has made kind of frescoes on walls and small scale monumental structures, like this Panthéon. 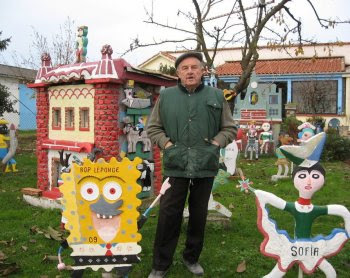 The environment is named the garden of Bépi Donal, the name Donadello likes as his nickname. As can be seen on next picture, Donadello also has been making a lot of paintings, which fully cover the walls of his interior (together with the prizes won in jeu de boules competitions). * posts of Bruno Montpied on his weblog le Poignard Subtil of 5-9-2008, 13-9-2008 and 21-9-2008 (in french, with a lot of nice pictures).